Each year more than 40,000 medication errors, including incorrect prescriptions are made in the NHS. Approximately 50% of these errors will cause moderate to severe harm to patients. We can help you to recover the compensation you deserve. Speak to one of our friendly solicitors for a free, no obligation discussion on 01925 937070. Or you can complete our Personal Injury Claim Form with details of your incorrect prescription claim. 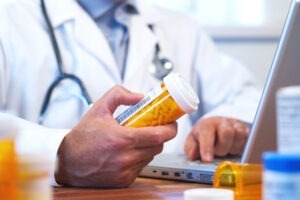 General Practitioners can sometimes prescribe medication repeatedly for many years without considering whether a repeat prescription is actually suitable for the patient, sometimes leading to physical injury from chronic overdose or addiction to certain medications. Pharmacists can make mistakes because they cannot read the doctor’s writing on the prescription, or accidentally give an adult’s dose to a child. If your doctor has prescribed a particular kind of medicine, but you have been given a different kind or a different dose by the pharmacist, you may be able to make a claim for compensation – just remember to keep the packaging your medicine was in. Have you been given the wrong prescription and medication causing personal injury? Why choose DSM Legal Solicitors for your prescription medication error claim? We have free on-site car parking at our Warrington office, together with disabled parking and access including a lift. We offer no win, no fee meaning that if you lose your claim you do not pay a penny. Only a fully-qualified, experienced solicitor will handle your claim meaning that you receive the best possible outcome. We have an excellent customer service record – read our client testimonials to see for yourself. We can arrange to speak to you in the evening or at weekends if you are unavailable during office opening hours. Solicitors in Warrington, Cheshire with clients across England and Wales. Click here to complete our Pharmacist Negligence Incorrect Prescription Negligence Enquiry Form or telephone 01925 937070 to speak to a solicitor in confidence today. We’re more than happy to answer any questions you may have. We can assist with personal injury (accident claims), road traffic accident claims, medical negligence claims, accidents at work, criminal injury compensation claims, wills and probate, oaths, affidavits and statutory declarations, lasting powers of attorney, employment law claims, settlement agreements and professional negligence claims.